Writing this blog has taught me to be far more observant of my surroundings than I have been in the past. 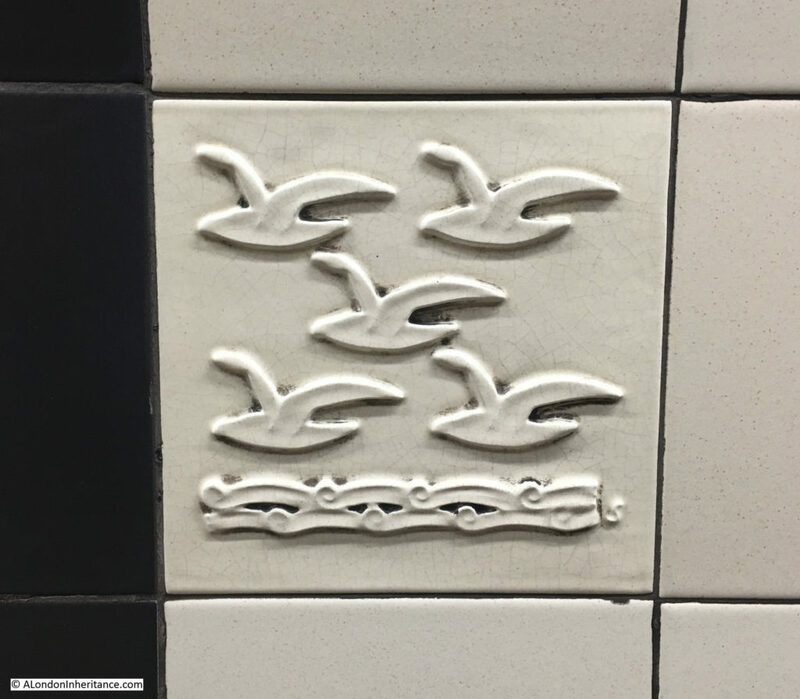 I have no idea how many times I have walked along the Central Line platforms at Bethnal Green underground station, but in all those times I cannot say that the random tiles placed along the platform walls have resulted in a second glance, or the realisation that there is a design purpose behind these tiles. I was visiting Bethnal Green again a couple of weeks ago and spent some time walking up and down both platforms, looking for the different tiles and taking photos. I have also tried to find the inspiration for the tiles and have been successful in a number of instances, but have yet to trace the origin for all of the tiles. The tiles appear to represent London landmarks and associations with the counties served by the London Underground. 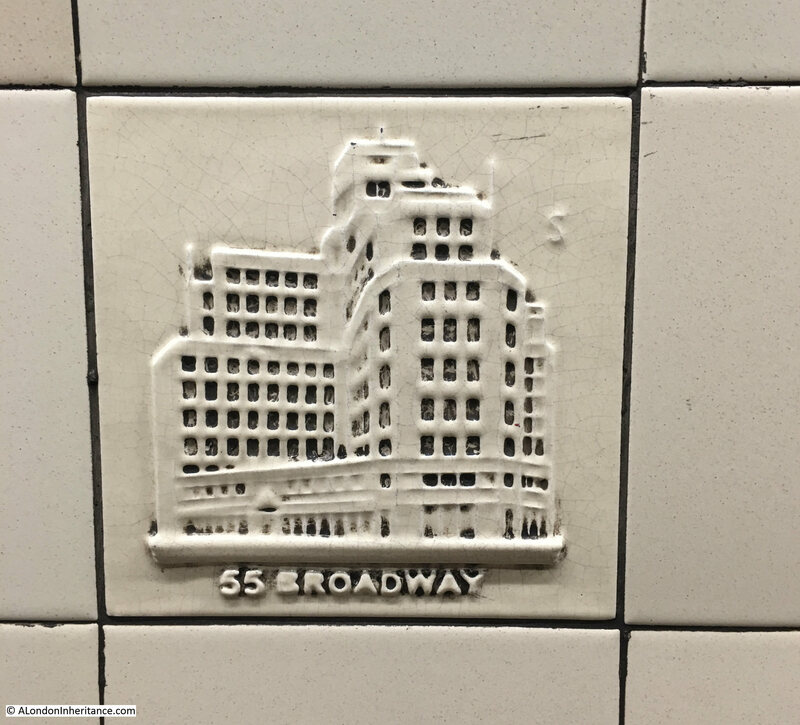 The first tile is a rather good representation of London Underground’s head office at 55 Broadway. The Bethnal Green name is along the centre of the roundel in the photo below. 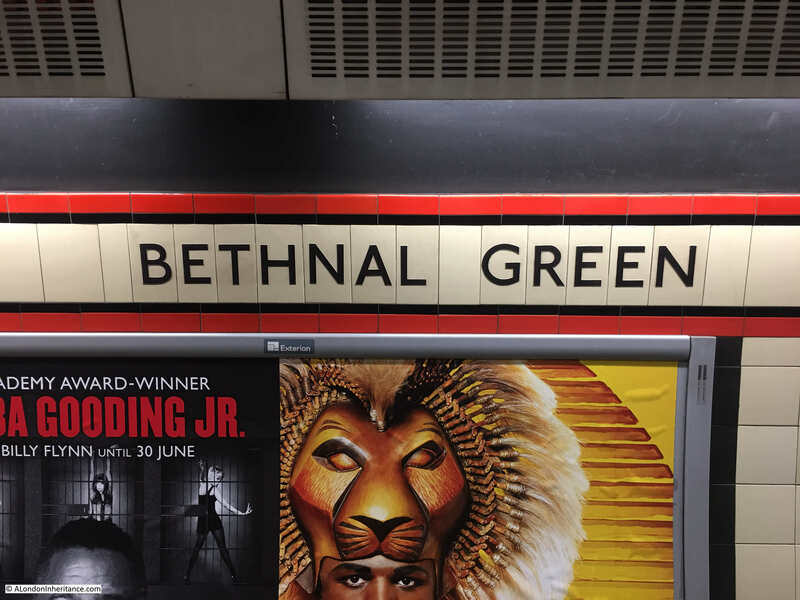 To demonstrate the random distribution of the decorated tiles and how they blend into the rest of the tiling, look to the left, at the level of the wording for Bethnal Green in the centre of the roundel, past the vertical black stripe and you can just make out a slightly raised tile. This is one of the decorated tiles. 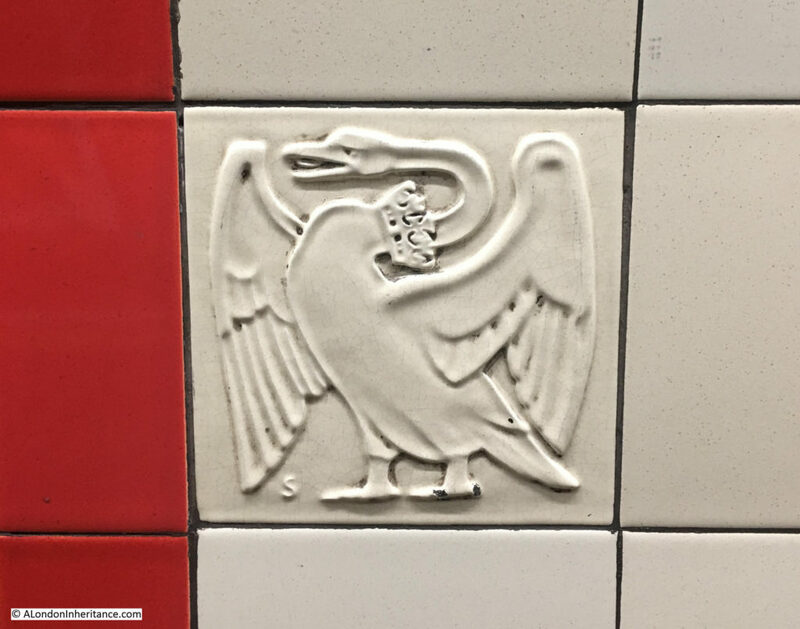 The following tile shows a swan with a crown around the neck. This has been used as a heraldic badge since medieval times. It was used by the 2nd Duke of Buckingham and was adopted by the county of Buckinghamshire, also being incorporated in the coat of arms of the Metropolitan Railway. If you look just below the left hand wing of the swan on the tile, there is a letter ‘S’ which is repeated on the majority of the tiles. The ‘S’ is for Harold Stabler who designed the tiles. He was originally asked by Frank Pick, the Managing Director of London Underground and the first Chief Executive of London Transport, to design a rabbit mascot for the country buses run by London General in 1922. There are two crowns and what looks like a bowler hat – I have no idea what these represent, perhaps Monarch, Lords and MPs? Harold Stabler was born in 1872. He was a skilled designer and worked in a number of materials including gold and silver and one of his commissions was the Ascot Gold Cup. in 1936 he was appointed by the Royal Society of Arts as the first Designer for Industry, and he provided consultancy work on design to a number of industries and public bodies. 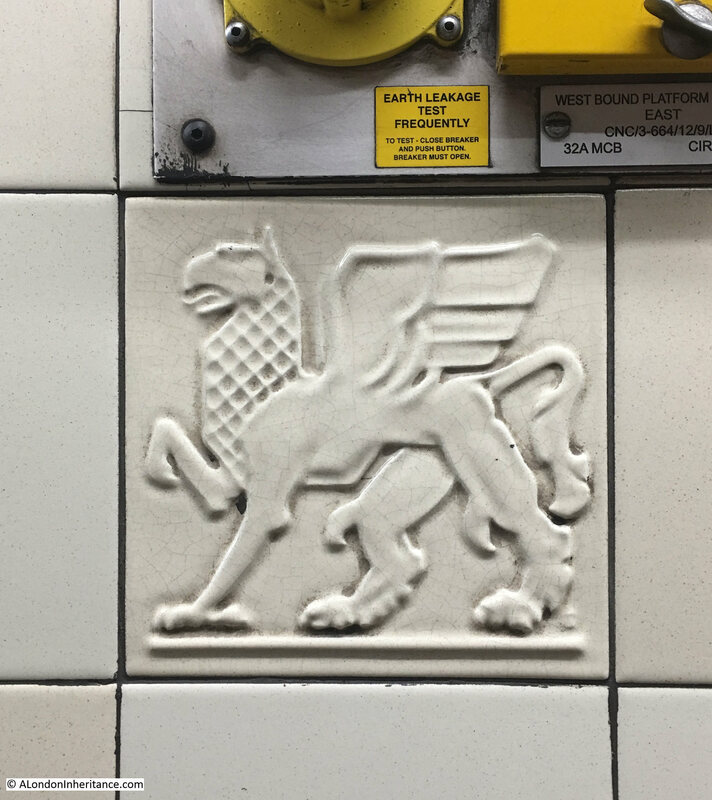 He was involved in the creation of a pottery in Poole and it was this business which would create the tiles for the underground using Stabler’s designs. He completed the tile designs in the 1930s, however Bethnal Green station did not open until 1946 as works for the Central Line extension had been delayed by the war. 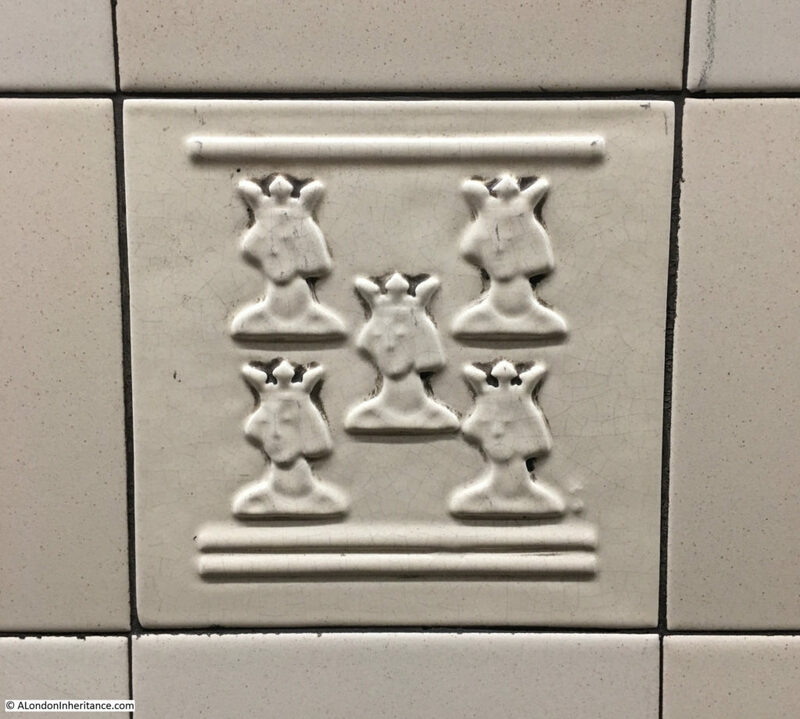 The following tile shows what I assume to be five kings. The horizontal lines have some meaning, but I have not been able to identify the inspiration for this design. Another tile has five flying birds rather than kings, and they appear to be flying over water. Again, I have not been able to identify the meaning behind this design. 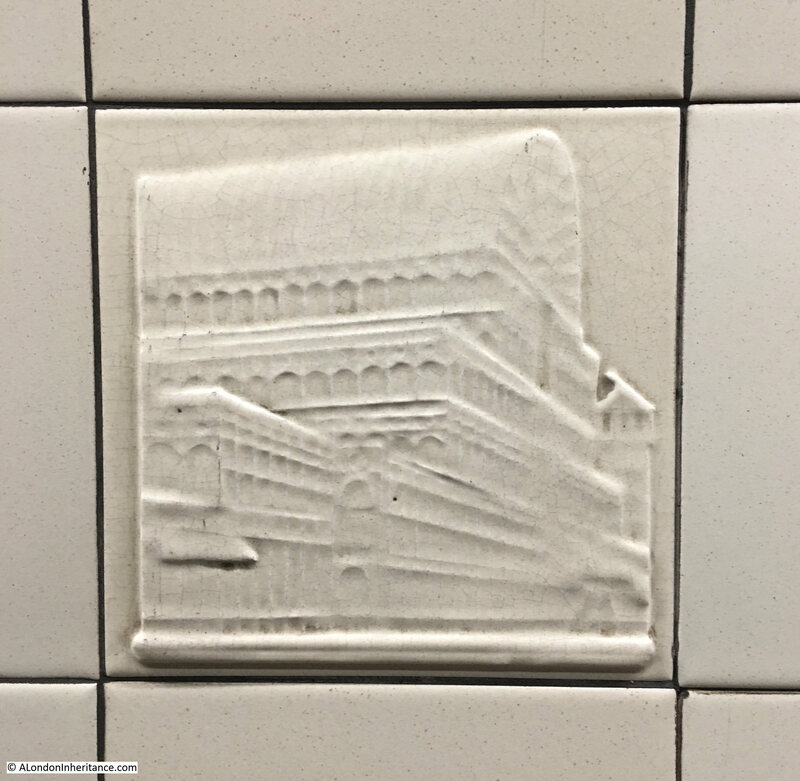 This design is of the Crystal Palace, however this tile does not have the ‘S’ to be found on all the other tiles, so I am not sure if this is one of Stabler’s original designs. The number five seems a common theme for the tiles. In the following design there are five birds, with two sets of short parallel lines between the top and bottom rows of birds. This tile is one of several held by the Victoria & Albert Museum and their record identifies this design as “five martletts, is the arms of the City of Westminster”. 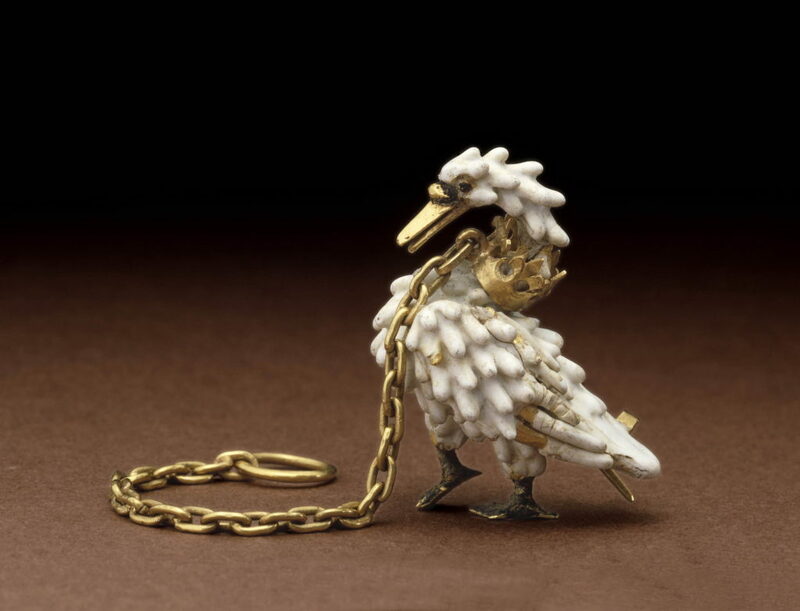 The following design appears to show the representation of a bird, such as an eagle. Another I have not been able to identify. The pictures are from the book ‘The Youngest County’ published by the London County Council in 1951 to commemorate the creation of the County of London. The book includes an overview map of London and the surrounding counties which helped with identification of a number of the tile designs. 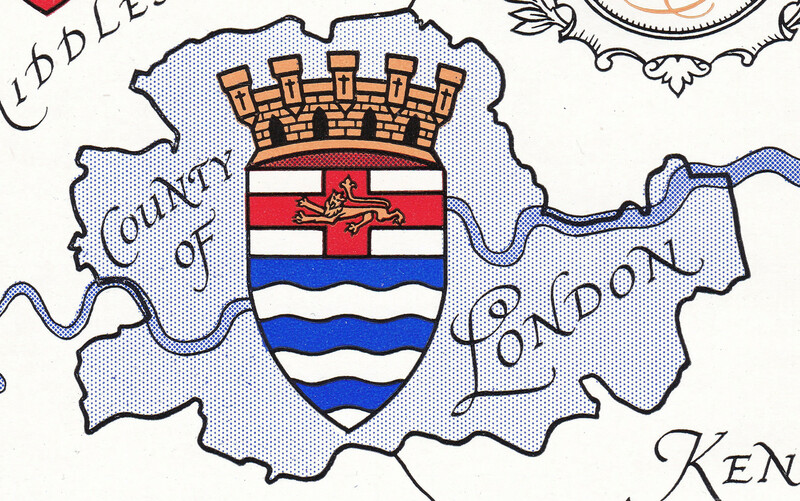 Which must be a representation of the Coat of Arms for the County of London, as shown below. Although the crown is missing, the “Cross of St. George charged with a lion of England” as described in the book The Youngest County which also describes the whole design, including the crown as “sets forth in heraldic language that London is the Royal Centre of England, situate upon the water”. 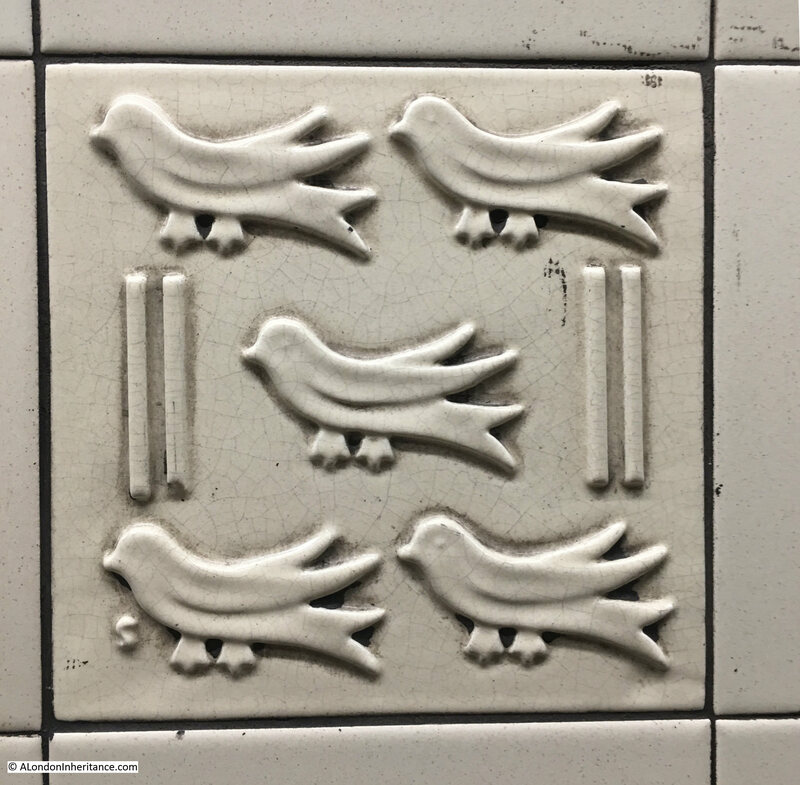 I hope that I found all the different designs at Bethnal Green, I spent some time walking up and down both platforms looking for, and photographing the tiles (and in the process attracting some rather strange looks from travelers on the Central Line). Although I have shown single tiles, there are multiple copies of each of these designs on both platforms. In 2006 many of the plain tiles along the platform were replaced with replica tiles. 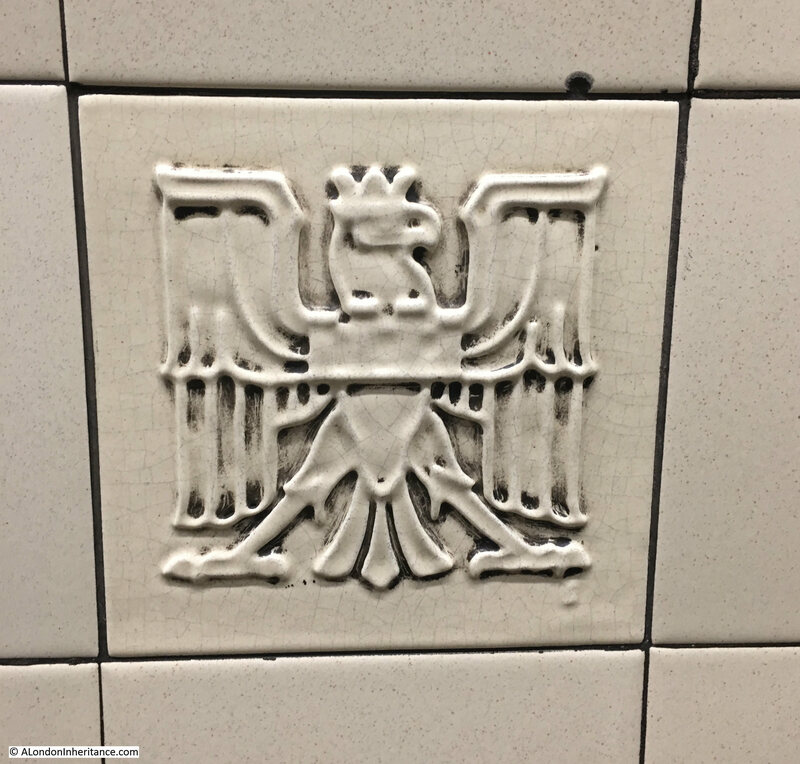 There are still some original panels of tiles, and I understand that the decorated tiles are also original, however I do wonder if the tile showing Crystal Palace may be a reproduction as it does not include Stabler’s trade mark letter ‘S’ and it does appear to have a slightly different finish to the rest of the tiles. Stabler’s decorated tiles were also installed at St. Paul’s, Aldgate East, St. John’s Wood and Swiss Cottage Underground stations. I believe they are still to be seen at Aldgate, but not sure of the other stations – something to check when I can visit. Harold Stabler died in London in 1945, however it is good to see that his designs live on at Bethnal Green. This entry was posted in Under London and tagged 55 Broadway, Bethnal Green, Bethnal Green Underground Station, Central Line, Harold Stabler on April 13, 2018 by admin. 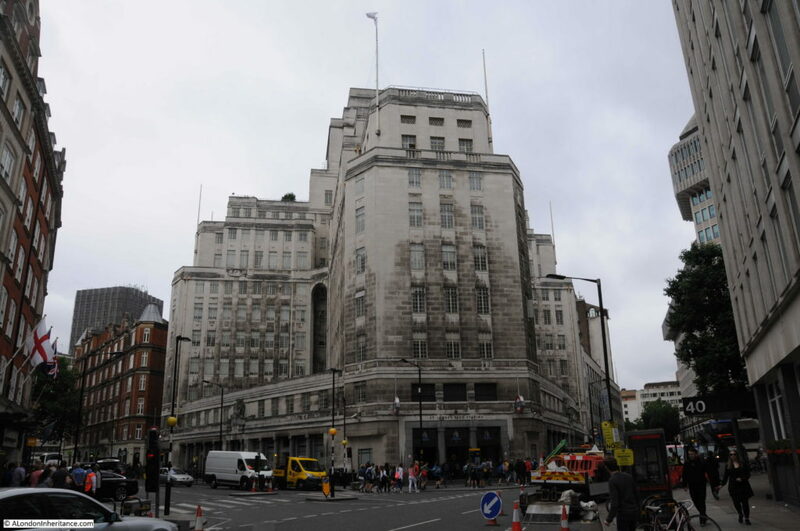 There seems to be some doubt as to whether TfL will move out of 55 Broadway. Planning permission to convert the building into flats expires in June this year I read. Love the photos & research. Fascinating. According to Antony Badsey-Ellis in Underground Heritage, Stabler was commissioned to design 18 tiles. The five kings represent Berkshire and the five flying birds London’s River. 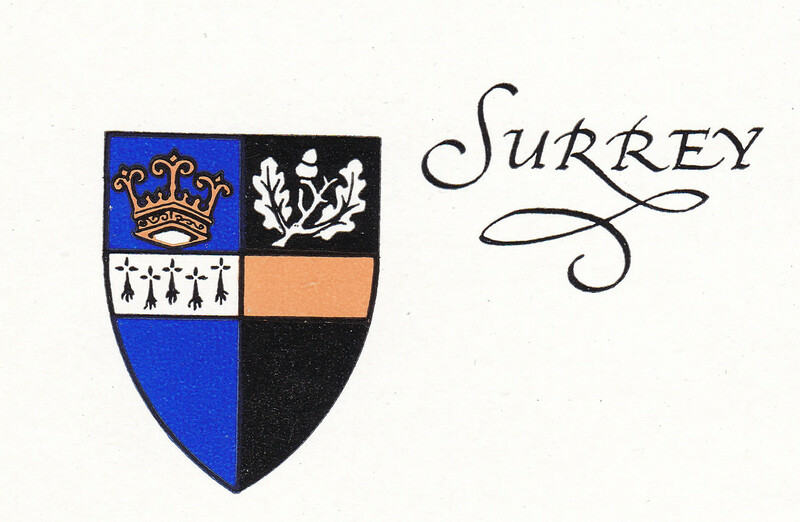 The five birds with parallel lines is for Sussex and the three ‘swords’ and crown is Essex. 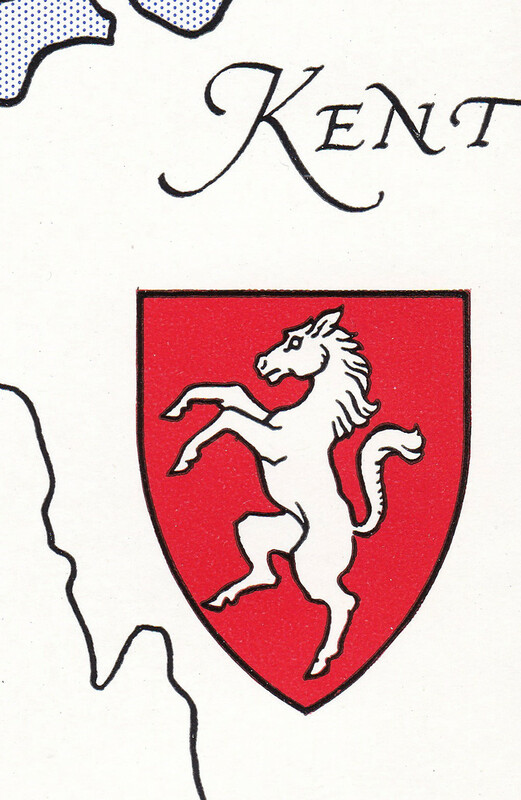 The ‘representation of a bird’ is for Bedfordshire, and the beast under the earth leakage sign is a Griffin. 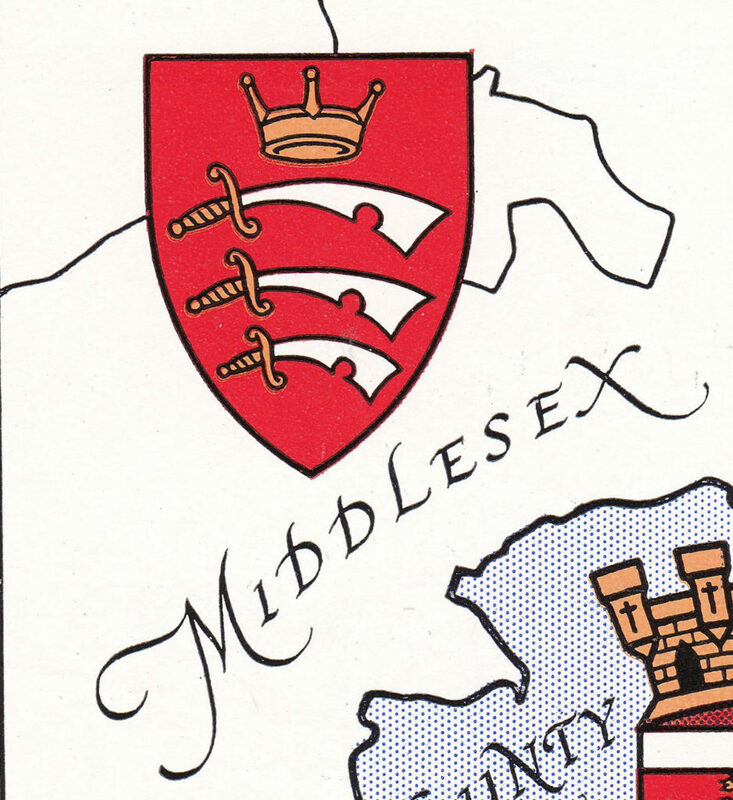 There were also tiles for Middlesex (just three swords), Hertfordshire (a hart). one showing St Paul’s and one of Thomas Lord. (All information from pp 18-19 of Antony’s book). Thank you for another fascinating, well-researched blog. I hadn’t a clue about this until now. Nice 1! I was born in Bethnal Green and I remember doing this in a project for for primary school about 33 (1985) years ago! We also got photos and did our write up and finding across the Rd at the museum. I think some of the tiles were badly damaged back then as I’m sure there was one of St. Paul’s ?? Well,Admin,you’ve just given us a very good reason to add a visit to Bethnal Green tube station to our list. However, this posting on a Friday- well it proper mogadorred us. We thought we had slept through from Thursday to Sunday! Another uplifting post – thank you! Great post, thank you. 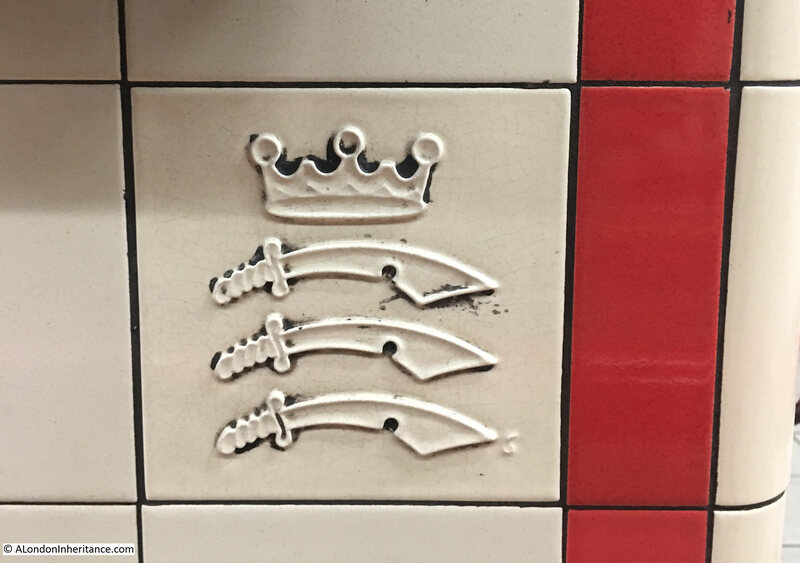 I knew I had seen the tiles somewhere and now know it was at Aldgate East. 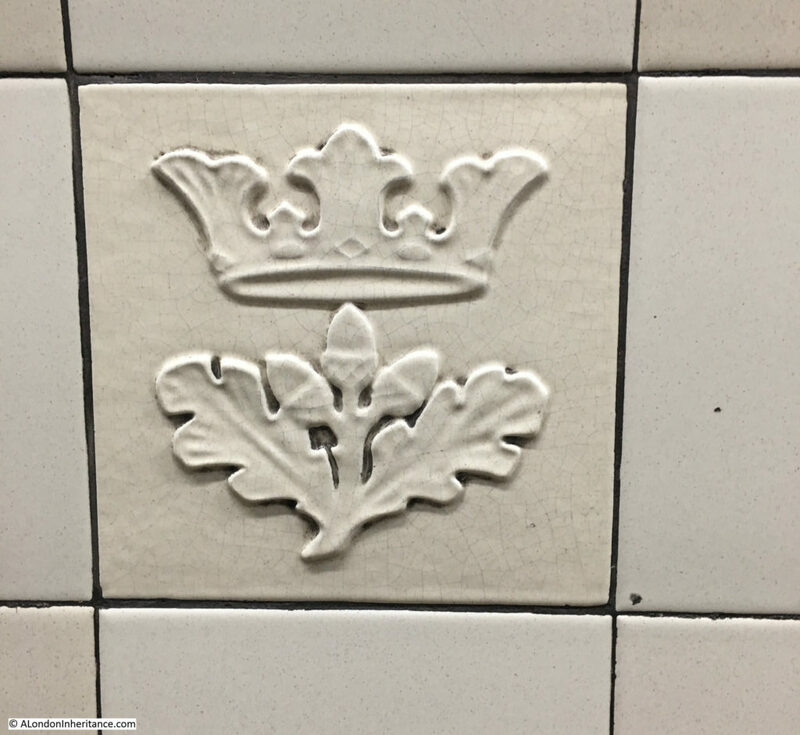 The Victorian Society says the armorial bearings are of the counties served by London Passenger Transport Board with Aldgate East being the station with probably the best, if incomplete, set of Stabler tiles today. Another interesting post, do you know what happened to the tiles that you mentioned were removed? Nice pics. There is indeed a good selection at Aldgate East as well which I photographed not long ago (and which includes a nice dome of St Paul design. St John’s Wood ones were still there when I was there fairly recently and should be safe now given the interest in heritage items (that, naturally, has the Lord design mentioned). Lovely to see the Stablers recognised. I have to admit, as the person who helped Commission the replica Stablers, that I have more than a passing interest in them. 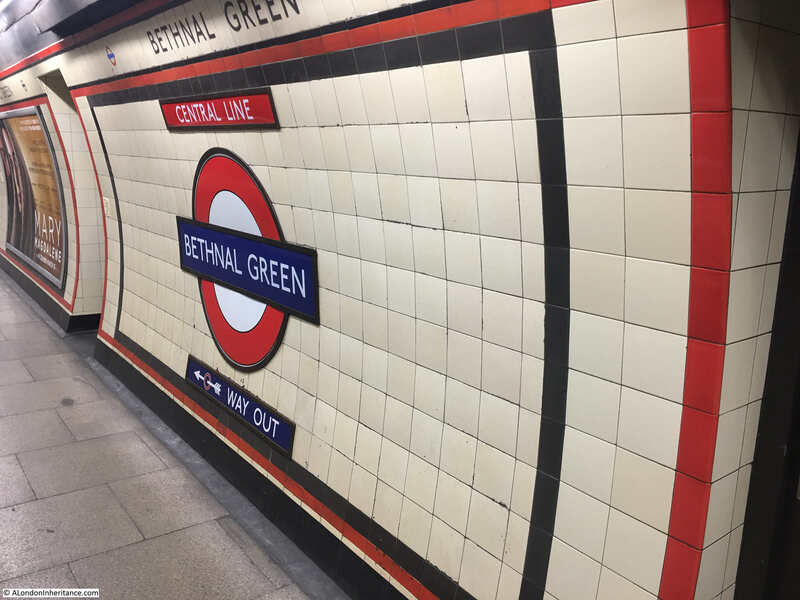 Bethnal Green was almost entirely retiled in new tiles under Metronet PPP works although we did retain four sections of original tiling as a deliberate policy to ensure some original material, including examples of Stablers, survived. The rest are new. Likewise at Aldgate East originals were retained on the flanking walls to the staircases at platform level – the main platform walls are new. 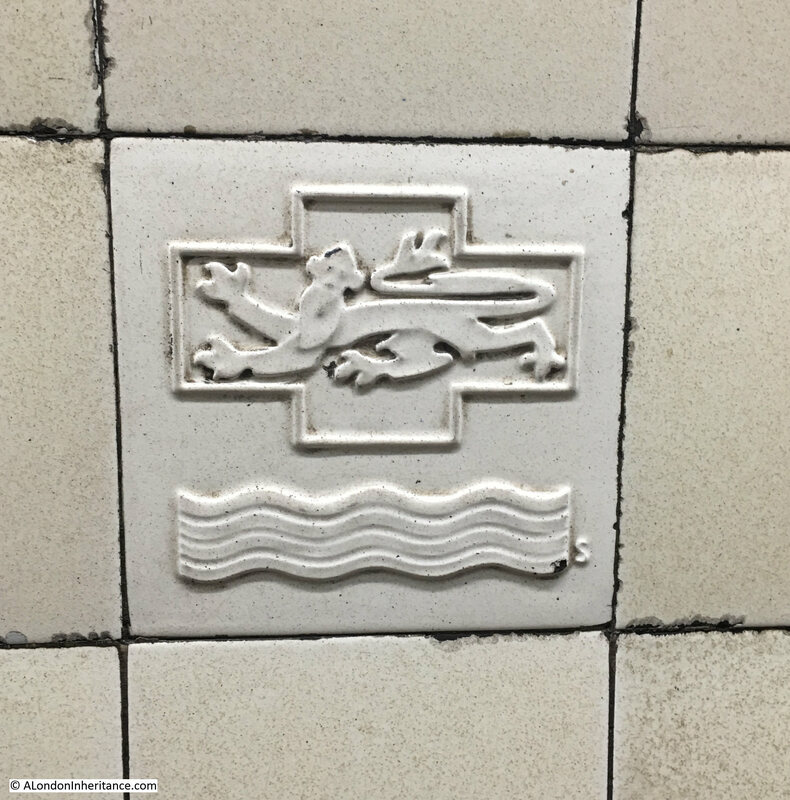 Swiss Cottage and St John’s Wood are all renewed and these two stations were the only two to have the Edmund Lord tiles by Stabler and thus had examples of all 18 designs. During renewal we did attempt to map what design was where so as to ensure groupings we as close to the original intent as possible. The only station that lost all its Stabler tiles was St Paul’s. They were latterly only in lower passageways. Examples of original designs, salvaged, are at the LT Museum and at Jackfield Museum (where the new ones were made bunCraven Dunnill) and I know of a private collector who has examples of Stabler’s own designs that were made and used at Poole where the originals were made. The the Palace of Westminster tile is apparently to show Crown, Lords and Commoners! Lovely to see the Stablers recognised. I have to admit, as the person who helped Commission the replica Stablers, that I have more than a passing interest in them. 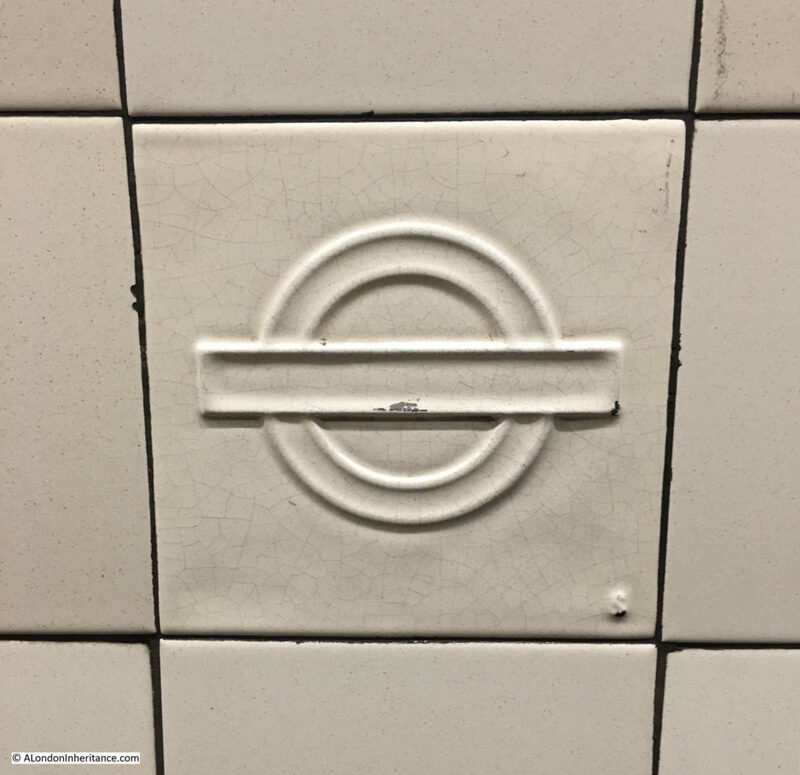 Bethnal Green was almost entirely retiled in new tiles under Metronet PPP works although we did retain four sections of original tiling as a deliberate policy to ensure some original material, including examples of Stablers, survived. The rest are new. Likewise at Aldgate East originals were retained on the flanking walls to the staircases at platform level – the main platform walls are new. Swiss Cottage and St John’s Wood are all renewed and these two stations were the only two to have the Edmund Lord tiles by Stabler and thus had examples of all 18 designs. During renewal we did attempt to map what design was where so as to ensure groupings we as close to the original intent as possible. 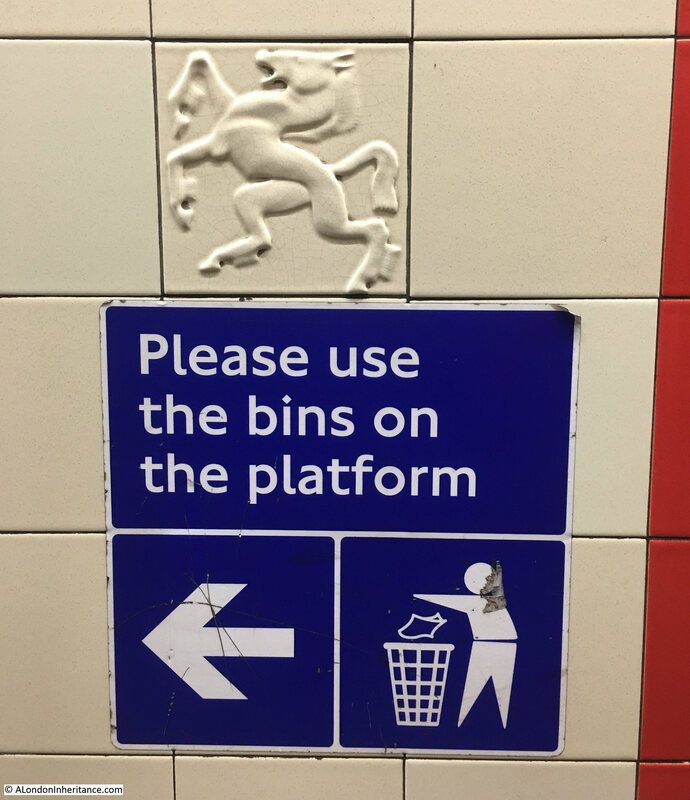 The only station that lost all its Stabler tiles was St Paul’s. They were latterly only in lower passageways. Examples of original designs, salvaged, are at the LT Museum and at Jackfield Museum (where the new ones were made by Craven Dunnill) and I know of a private collector who has examples of Stabler’s own designs that were made and used at Poole where the originals were made. 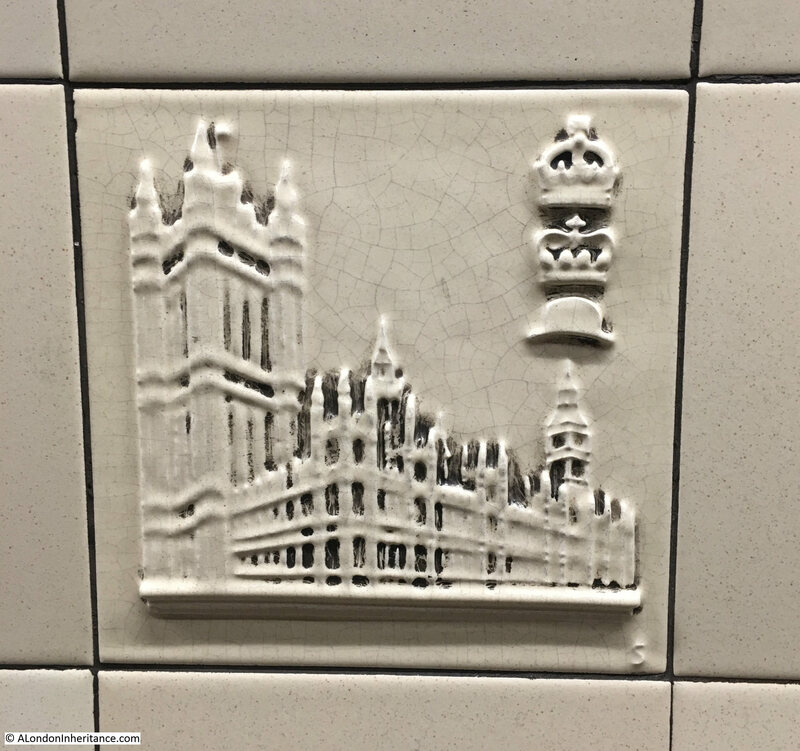 The the Palace of Westminster tile is apparently to show Crown, Lords and Commoners! I do have an original list of the total number made and the stations they were located at and I’ll try and post it on Flickr. I used to work at Bethnal Green tube station and I was there during the refurbished in 2006/7. I would suggest that not all the tiles at Bethnal Green are original as I have 4or5 in my garage somewhere, I asked the contractors if I could have them as they where just drilling them of and putting them in rubble bags ready for the skip.managed to get 4/5 but the others where to badly damaged. Having read your blog, we put Bethnal Green station on out list of things to do for our October visit. Today we approached a TfL attendant who knew exactly what we were asking about. He escorted us to the platform and gave descriptions of nearly every tile. How fortunate we felt to ask just the right attendant. Thank you for providing yet another item of interest for this pair of travelers from the USA.